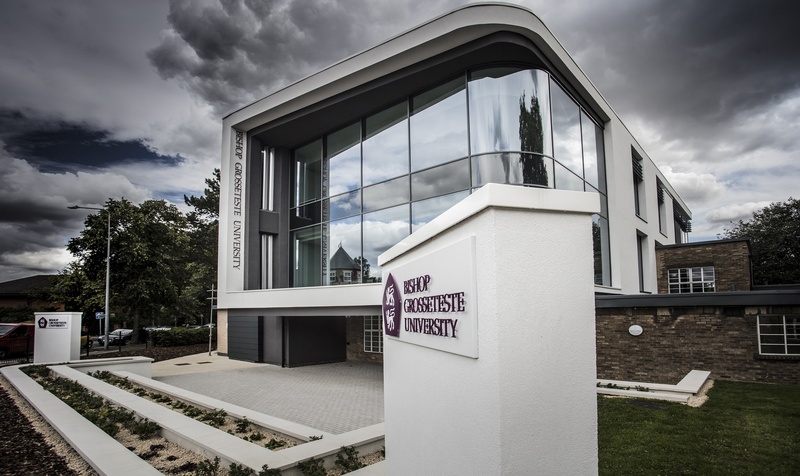 Bishop Grosseteste University (BGU) and LK2 – a unique company of chartered architects and sports & leisure business advisors – are pleased to announce that their recent renovation project has been shortlisted for this year’s RICS East Midlands awards. The impressive £2.2m redevelopment of BGU’s Constance Stewart Hall has been shortlisted for the accolade of ‘Design through Innovation’ at the upcoming award ceremony. Innovation was central to the redevelopment of BGU’s Constance Stewart Hall and LK2 needed to find a visually striking way of introducing a contemporary new extension to a historic building on the University’s campus. The vice-chancellor of BGU, the Reverend Canon Professor Peter Neil, said: “We are incredibly proud of both our 150 year history of teaching excellence and our progressive attitude which has seen us become the top university in the East Midlands for widening participation. “When it came to creating a new flexible teaching space we needed a building that would support our ambitions as well as a team who could understand this. The design by LK2 for Constance Stewart Hall perfectly captured this balance and our finished building provides students with cutting edge facilities to help them progress. We are pleased to see it rightly celebrated by the RICS”. The RICS Awards showcase the most inspirational initiatives and developments in land, real estate, construction and infrastructure. Across eight individual categories, the awards are regarded as the premier property and construction awards in the country, celebrating the most innovative projects in the region and their impact on local communities. LK2’s innovative approach to this redevelopment, has resulted in one of the project’s most unique characteristics- the architects were able to blend both new and old elements to create the illusion that the contemporary extension is sailing over the original building. The winners will be announced at a ceremony at the Nottingham Belfry on Thursday 3 May. Visit our new development by booking on to a 2018 BGU Open Day now. The Family Diversities Reading Resource at Bishop Grosseteste University (BGU) in Lincoln has been updated to mark its tenth anniversary.